We have often prayed this part of "The Lord's Prayer". But God has been stirring in my heart to show me something more than I have seen before. Many people do not realise there are two parts of releasing Heaven on the earth. The first part or "step," as it were, is to see what it looks like in heaven. We find ourselves in a situation where we want to see God manifest and heaven released. The first part of this journey is to immerse ourselves in heaven and fill our minds with the Father's will. We need to know how heaven sees and responds to the situation. We renew our minds to know what the Father's will is and what the kingdom of heaven looks like. We need to behold this reality until it becomes a part of who we are. We are transformed to become a taste of heaven in that area. The second part or "step" is to establish on the earth what we have seen and now understand. We take the precious revelation and wisdom that heaven has given us and we release this life into the situation. Our conversations, actions and responses to the situation are all part of heaven being released through us. We become like Jesus to the situation. We become the answer. We become heaven, on earth. Many people that I know seem to be brilliant at either one or the other, and potentially both but in different situations. For instance, I know people who are very good at sharing what they see about a situation. They speak out with confidence and see it come into line with their words, actions and desires. The only thing is that they often operate from worldly wisdom or from their own fears. On the other hand, I know people who have grown to love the secret places of heaven, which are not secret when you are God's friend. They constantly see what heaven sees when they look at a situation. But their difficulty comes when they wish someone else would address the situation. They have the pattern of heaven for the situation, but they do not take the step to become the answer in that situation. This often leads to grumbling and criticism. I know that I have been guilty of both these errors. They are common challenges for those who are pursuing the prophetic. And while I have always had people in my life who encourage me to keep going, I did not have people to show me the "how to", only Holy Spirit does that. He teaches us all things. Jesus walked in both parts of this picture. He told His disciples that they would see angels ascending and descending on the Son of Man. What was He talking about? He was speaking of a mystery relating to Jacob's Ladder. Jacob had an encounter with this stairway in the night. Even Solomon talked about secret stairs. I had often wondered why there was first the ascending, and second was the descending. I believe this reflects the same principle. First, we ascend to heaven and receive the perspective and the answers of heaven. Then we return to the earth to ground out what we have seen. As it is in heaven, let it be on earth. God desires for us to have amazing encounters and revelations. We need to be going in to heaven and seeing and learning what the heavenly solutions are. Then we also need to bring that revelation with us into our everyday life. 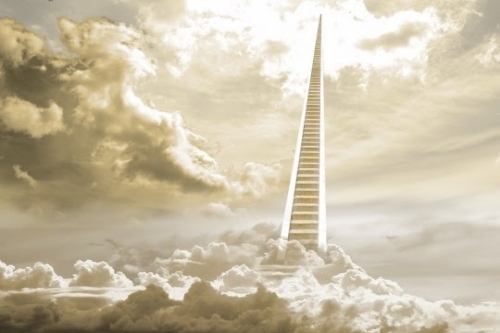 God wants us to become a secret stairway of the heavenly hosts, so that our lives will allow heaven to manifest through us. The kingdom of heaven is within us. We carry heaven inside of us. As He is, so are we in this world. We become Jesus. What good is it for us to have profound encounters if we do not walk them out? There are encounters that happen in a moment, but take years for them to become a part of our everyday reality. I have observed that it is in the grounding of an encounter is the value or weight in the spirit. It is incomplete to have an encounter without living it out. This is true the other way, if we are changing our situations, but without first having the wisdom of heaven. True maturity is to live suspended, as it were, between heaven and earth. It is all part of this dance between heaven and earth which happens in and around us. We open our hearts and spirits to become a secret stairway between the dimensions.